At its last board meeting on December 8, Metrolinx presented an update on the status of 12 new GO Transit rail stations, all located on existing lines. Eight of these proposed new stations are located in the City of Toronto; and six of those are station locations once promised as part of John Tory’s SmartTrack proposal. To put it bluntly, Metrolinx should go back to the drawing board, because these station layouts aren’t helpful for providing useful connections to local transit, nor do they maximize the development opportunities at rapid transit stations. 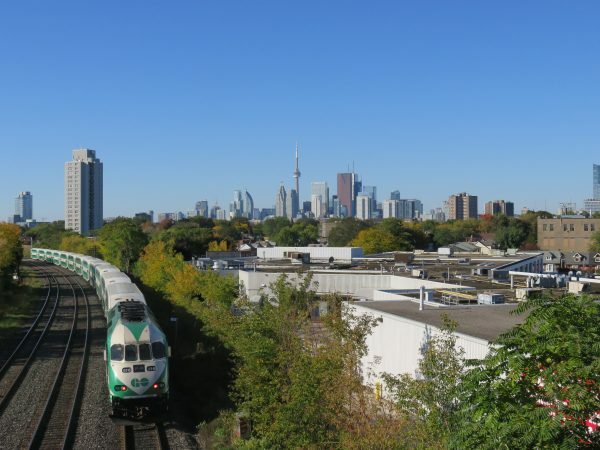 With only a few exceptions, GO Transit stations are located in suburban settings, and their defining features are massive parking lots and/or multi-story parking garages, and gigantic bus loops and passenger pick up and drop off areas, known as PPUDOs. Historically, GO Transit’s use of sprawling station designs made sense. GO Transit started off as a commuter rail system designed to reduce traffic headed to and from Downtown Toronto. When the commuter rail system was created in 1967, local transit in most of Toronto’s suburbs was poor or non-existent. Railside industrial lands were inexpensive to purchase for massive parking lots. But to this day, GO Transit remains focused on building more parking spaces for its commuters, even in urban settings, such as Downtown Brampton. The cost of building and maintaining parking lots is included in GO Transit’s fares, while the TTC charges for parking at all of its lots. GO Transit’s fare structure penalizes short trips in favour of long-distance commuters. If GO Transit wishes to implement regional rail, especially to deliver what’s left of John Tory’s SmartTrack proposal for frequent urban rail service integrated with the TTC, GO Transit will have to change. Unfortunately, the proposed new station designs (all available in this Metrolinx report) appear to be of the same suburban thinking, with needlessly large bus loops, PPUDOs, and parking lots. Despite plans for frequent, electric regional rail services, known as GO RER, all the new station designs are for conventional 12-car diesel-hauled trains. Connections to local transit are neglected. Toronto deserves better. 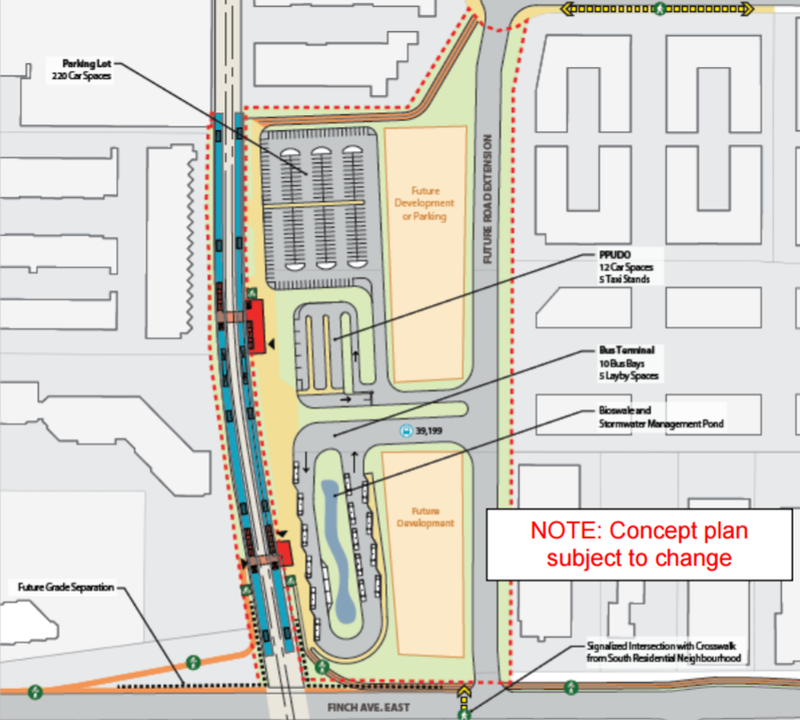 At Finch East Station, for example (illustrated above), there is a 220-car parking lot, a bus loop built to handle 10 buses, and a PPUDO, all accessible from a new roadway north of Finch Avenue East. Only two existing bus routes would connect to this station, 39 Finch East and 199 Finch Rocket, so the large bus loop is completely unnecessary and would add running time to both routes. In fact, it would be preferable to extend the train platforms south, across Finch Avenue, with the buses stopping on street. This would create more available land for transit-oriented development. 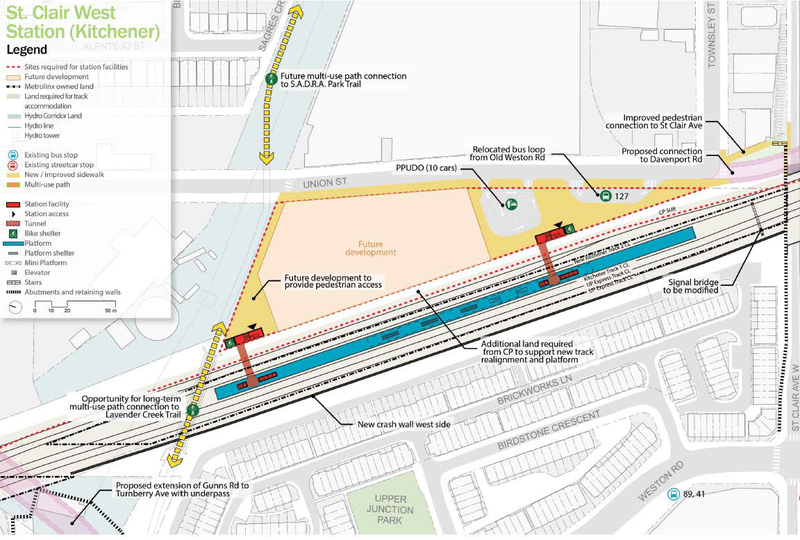 The proposed Gerrard GO station manages to miss a proper connection with the future Relief Line, which is proposed to run under Pape Avenue. It also features a needlessly large bus loop. The TTC tends to build compact bus loops with an enclosed passenger waiting area in the middle, with direct access to rapid transit; instead this large, surface bus terminal is built to suburban specifications, including a stormwater management pond. An integrated development, like that at York Mills Station where the bus terminal is located below an office complex, should be investigated instead. 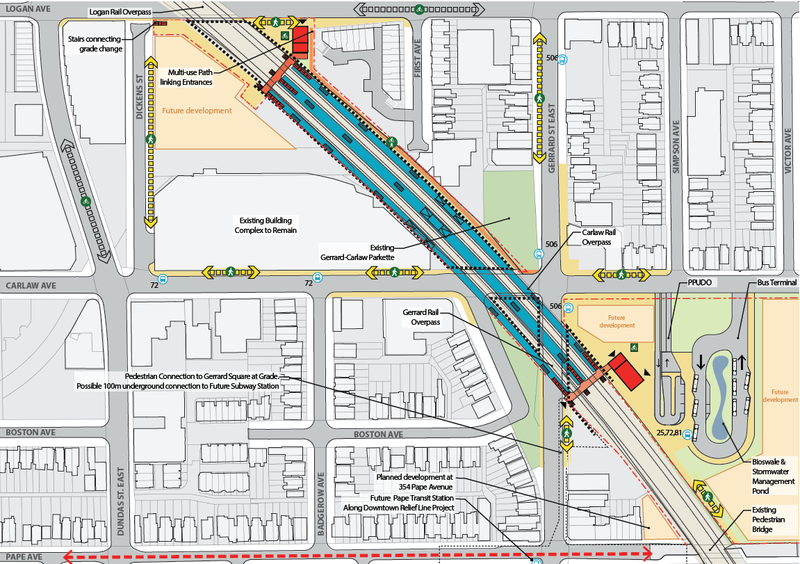 St. Clair West, another proposed station near Keele Street and St. Clair Avenue, is especially disappointing. Located north of St. Clair Avenue West, the pedestrian access points lead only to the east, to Union Street. This makes for long walks to the 512 St. Clair Streetcar and the 41 Keele, 89 Weston, and 168 Symington bus routes. A tiny bus loop accommodates the 127 Davenport bus, which currently loops nearby on Old Weston Road. In the report, Metrolinx notes that a connection to the 512 car is “challenging” but it also notes that the TTC wishes to route some bus services into this station. The proposed station plan doesn’t even try to make these necessary connections. If we’re serious about creating a regional rail network, integrated with the TTC and other transit agencies, the station designs need to reflect this. After all, Tory touted SmartTrack as a quick-build transit relief project. But without proper integration with the TTC surface network, including easy and attractive transfer opportunities, these opportunities are limited. The TTC builds its subway stations with these crucial surface transit connections in mind. It’s time for Metrolinx to do the same at its new GO stations. This large footprint size requirement may be why a proposed “Liberty” station is kinda far away from the needed/logical place to the point of it maybe really not being worthwhile to build, not that the City would embrace building new transit in the west end eg. the DRL of 1985 which had a robust transit line along Front St., and continued it west through the same land that Mike and Gord are quite happy to build a new road, piecemealed from the Front St. Extension plan, but called a new Liberty St. to fudge it, in an EA that doesn’t look at transit options because it’s piecemealed. We could really use (finally) a dusting off, revising, and doing of improved connections between the two GO/RER lines that are at Dundas St. W./Bloor, and east and Main/GO. This might be a way of getting a surface relief function within a few years and without billions of unfunded cost, as we persist in building subways to sprawl that cost billions, and in the case of the Suspect Subway Extension (SSE), seems really blighting and unable to think of any other option beyond any type of subway as long as it’s aligned here. Merely 10 years ago, TTC approved an 8-month shutdown to revamp the tracks and vehicles of the SRT for about a tenth of the subway cost, still a lot of money, but we don’t want to squeeze the billions. Kudos, Sean. Excellent piece. Metrolinx needs a massive change in vision if it’s to maximize return on investment, both in terms of financing and maximizing transit’s competitiveness, regionwide and in truly urban areas. As is, it remains largely a sleepy commuter rail company whose thinking is stuck in the 1960s. Unless we turn those suburban station catchment areas (especially everywhere within a potential 5-minute walk of the platforms) into pedestrian-friendly, multi-use, all-day destinations for everything from living, working, shopping, schooling, playing et cetera, RER’s new operating costs are going to badly outstrip new revenue (you can include lots of parking, but the lands cannot be single use parking). Do it right, and the suburban bus operators will have way more reasons to improve their all-day services, and not just to the stations). We need to go way beyond the Mobility Hub concept (stuff I outlined to Metrolinx in response to their green and white papers years ago). It’s not just a planning thing, it’s a business thing … much of which needs to incorporate lessons from MTR Corp’s rail-plus-property model. Another problem with the bus loops? They make for an uncomfortable ride as bus operators swerve mightily, and often too-aggressively, to enter, navigate, and exit the damn things. No one who actually rides buses would ever design a bus loop unless there was absolutely no other way of providing a bus-train connection. These plans were, as is customary, designed by people who drive everywhere in their daily lives. Metrolinx is does not see the big picture beyond trying to buy votes in the 905/795. Davenport deserves better. Toronto deserves better. Ontario deserves better. “At Finch East Station, for example (illustrated above), there is a 220-car parking lot”. I understand this is an example, but are any other proposed Toronto stations contemplating parking lots? I could be wrong but don’t believe so. at Pape Avenue and a significant development site. adjacent properties and real estate requirements may be incurred. This is really weak. Generally, we’ve seen Metrolinx been pretty good with their work and this is a disappointment. The communities need to rally and get fixes to their stations. Time to speak up! It seems pretty obvious the people who came up with these designs do not actually use urban public transit. If they did you would see a more transit and pedestrian friendly layout for these metropolitan stations. Given that Metrolinx still refuses to grant Mobility Hub status to Long Branch GO Station, on the Toronto-Mississauga boundary and which is a terminal for MiWay buses, TTC buses, and the 501 Queen streetcar route, it is clear that they still think in suburban, not urban, terms. Furthermore their obfuscation of the GO train and bus fares within 416 clearly shows their 905 bias, reinforced by the fact that GO trip fares within 416 are much much higher than equivalent distances in 905 land. The Province has an amazing opportunity to build a workable 416-905 urban transit system on the GO Train network, but Metrolinx is hampering this with their suburban myopia and stinginess when it comes to design of their new 416 stations, and fare integration of GO services with the TTC. GO Transit’s Regional Express Network of 15 min all day GO Train frequencies has the potential to transform travel within the GTHA, but Metrolinx is falling down on building a truly region-wide transit system, by penalizing the heart of the region, Toronto. Further to all the above comments, what immediately strikes me is that any leaning I had to thinking the TTC would be better off folded into GO has evaporated. If GO is this completely inept at providing *city* stations with *city* realities, then the TTC would be completely crippled if part of GO. Revenge of the 905. Brutal compared to the effort the TTC put into its suburban stations when they were built in the 70s, like Lawrence with its integrated bus bays that made connections a snap, even though it cost a pretty penny to do it. At the root of the current problem is a lack of agreement as to what we want transit to do. Because of that, we find different people talking in entirely different languages when they lay out their thoughts as to transit investment priorities. Is the purpose of transit to support life in the city as we have become accustomed to living it up to now, or is it to set the pattern for life as we will need to live it in the future? Is it to support current development patterns or is it to lay the foundation for the kind of development that we need to encourage in the decades to come? The unfortunate shorthand description for this conflict is that we have competing urban and suburban visions of transit policy. While for a time the urban vision held top position in Toronto, it is now appears to be the preserve of a rearguard rebel band only. The suburban empire is striking back. Then, of course, there is the factor of leadership that declares that everything is a priority and that the miracle of tax increment funding means that we can have it all for free. But that’s democracy for you.